The presentation of each menu item is obviously done with an incredible amount of love and care. Each preparation is clean and fresh and compiled without a lot of fuss. The freshness of the ingredients and presentation drives home the fact that you are also eating a healthy and very unique meal. Peppermint Thai Owners Love What They Do! 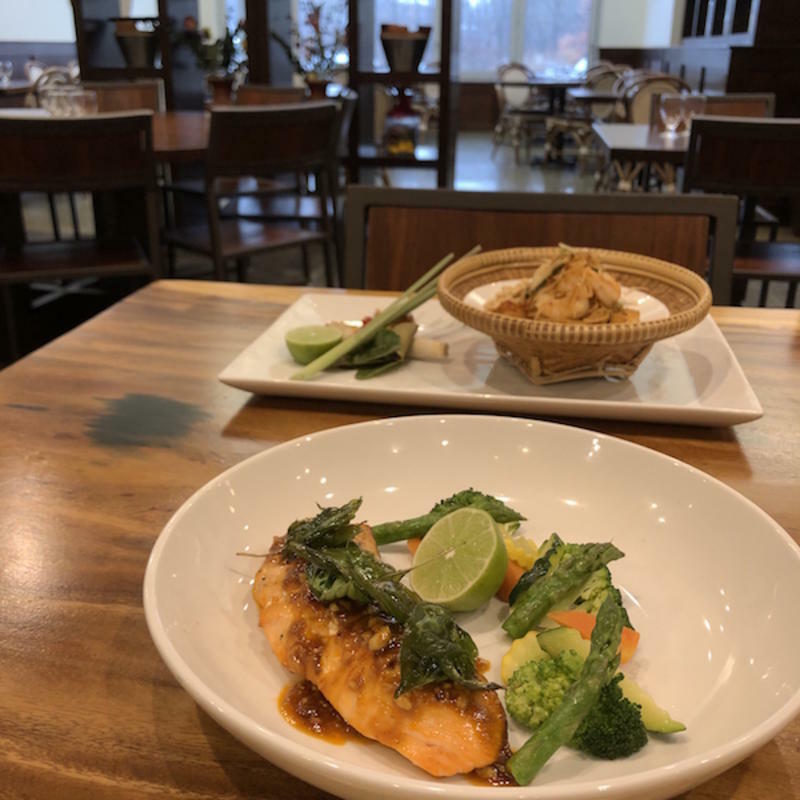 The owners, Sunny and Matt Kanegkasikorn, opened Peppermint Thai Cuisine in December of 2007 and each of them work in the restaurant every day. The menu ingredients are picked fresh by Matt at the market each morning to ensure the freshest and highest quality food is served to each and every one of their guests. We tried a variety of dishes to get an overview of the restaurant and the menu and we were extremely pleased and impressed with every one! The colorful presentation of each were an added bonus. First was the Crab Tempura Appetizer. WOW! 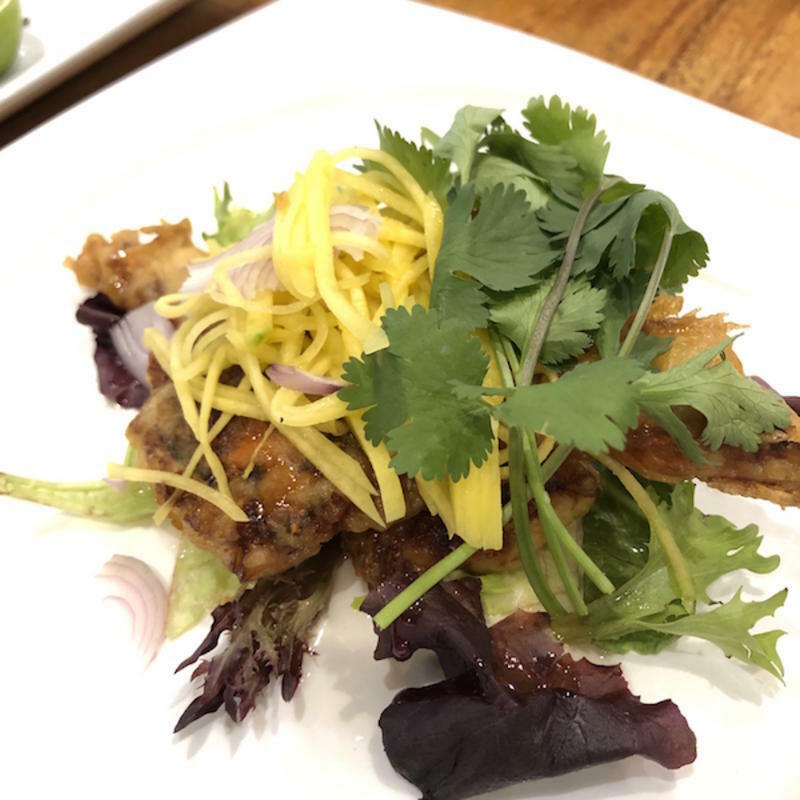 The dish included a very tender soft shell crab that was cooked to perfection and perfectly selected and plated garnishes. There was nothing left! This was an exceptional introduction to what was to come. Next we tried the Pad Thai Country Style and it was absolutely the best Pad Thai I’ve ever had! It was the perfect amount of spicy and the side items on the plate were also the ingredients in the sauce, which was a very nice touch. The shrimp were tender and cooked perfectly. A phenomenal preparation! The final and favorite dish of the evening was the Garlic Salmon. We’ve been presented with many different preparations of Salmon in a wide variety of different restaurants, and I have to say this is my favorite Salmon dish of all time! Owner and Chef Matt marinates the salmon with a special house-made garlic sauce prior to grilling, and this pre-treatment is what really puts this dish over the top. Not hard to see why this is also a favorite of other guests as well! Peppermint Thai Restaurant in Cleveland Also Offers Authentic Thai Cocktails! 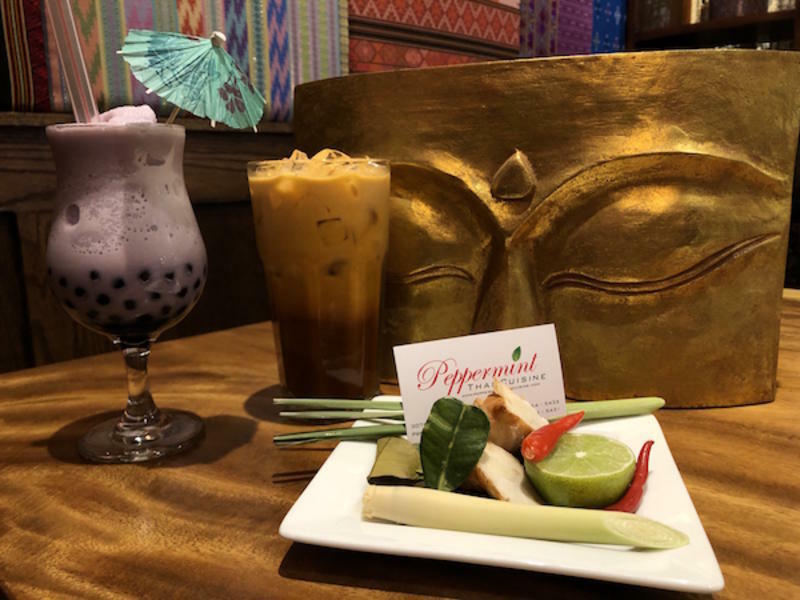 Peppermint Thai is a full-service restaurant featuring a full bar and a long list of Thai specialty teas and drinks. For the full-on Thai experience, try the Bangkok Dangerous or the Peppermint Mojito. Both of these house specialties are crowd favorites as well. They make fantastic Thai white and red sangrias at Peppermint Thai in Cleveland if you’re in the mood for a little sweetnes. A full line of Saki is also offered, as well as a complete wine list to complement any meal choice. Bubble Tea comes in a variety of colors, including red, green, purple, orange and black. Another crowd favorite is their Thai Tea, which is a special brew of tea, sugar and half and half. 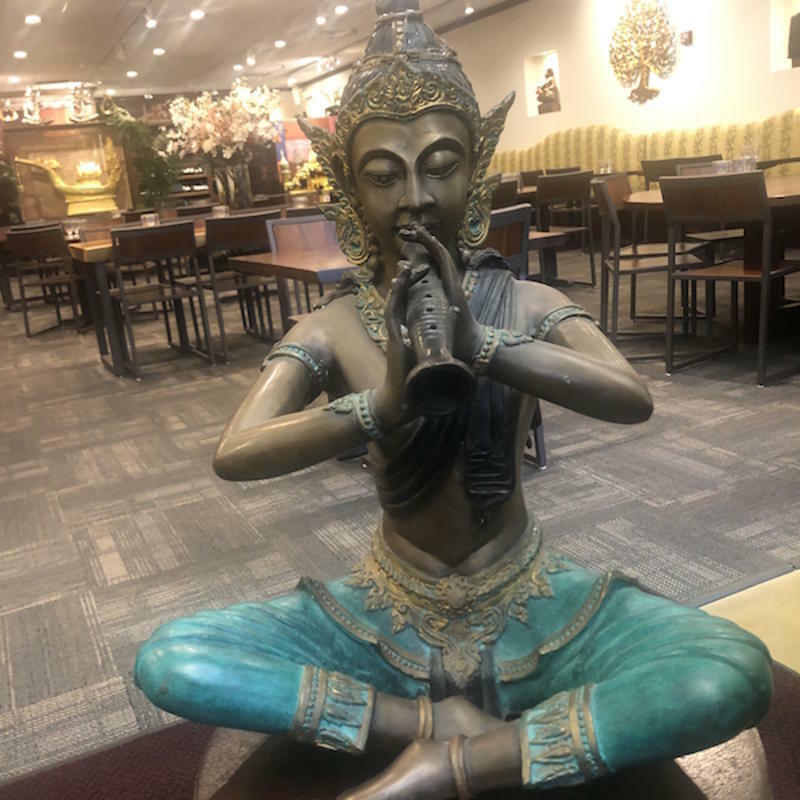 The dining room at Peppermint Thai Cuisine is large and roomy, so you have plenty of privacy and the ability to relax and enjoy your meal with friends and family. A patio in front of the restaurant is open when warmer weather permits. 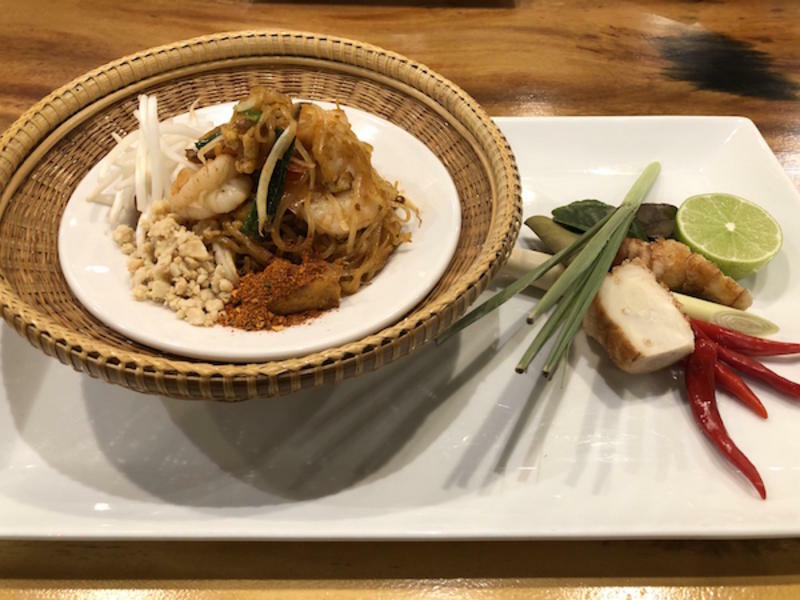 The food, drinks and ambiance at Peppermint Thai Cuisine are completely authentic and it's clear in every way that owners Sunny and Matt love what they are creating, keeping their customers happy and coming back for more! Mention Peppermint Thai Cuisine to anyone who has ever been here and you will get a overwhelmingly positive reaction. It's obvious that the love Sunny and Matt put into their restaurant will continue returning to them for many, many years!